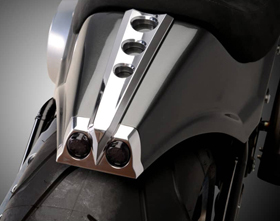 This headlight fairing kit was specifically designed to allow the mounting of the Night Rod Special headlight on Harley Breakout’s for a super-aggressive look! 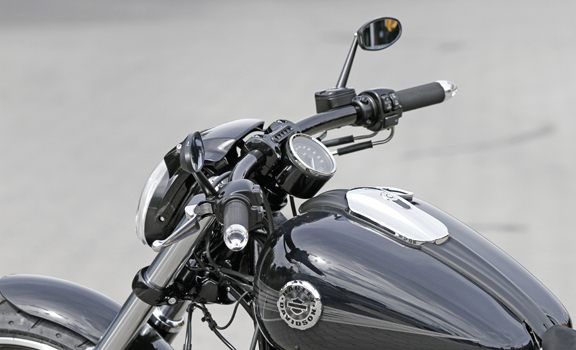 Kit includes OEM Night Rod Special headlight and fairing, mounting bracket, adapter cable and necessary hardware. For a super low and sleek look we reccomend to install it in conjunction with our Flat-Riser Kit (sold separately). 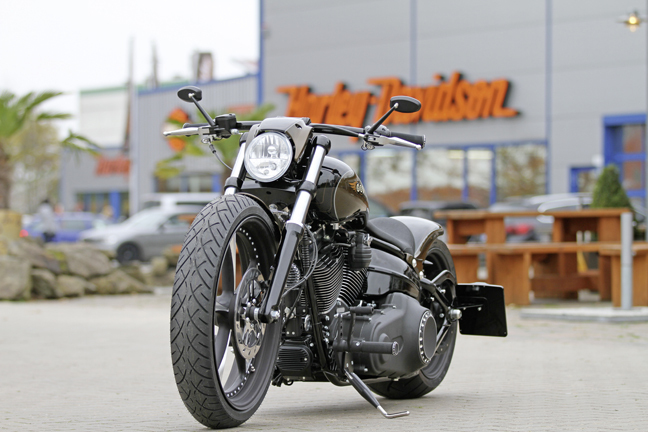 Looks great combined with our Turn Signal Grips. 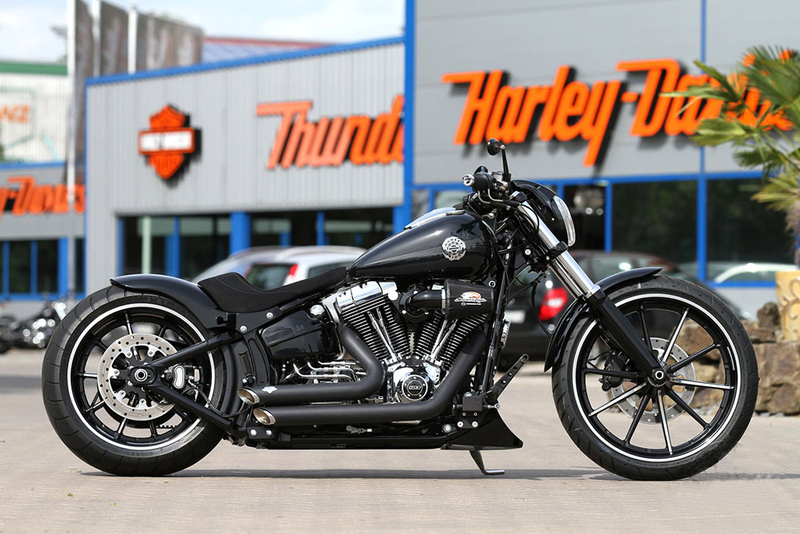 Hi Trying to fine out if this fairing kit would fit 2014 cvo breakout ? 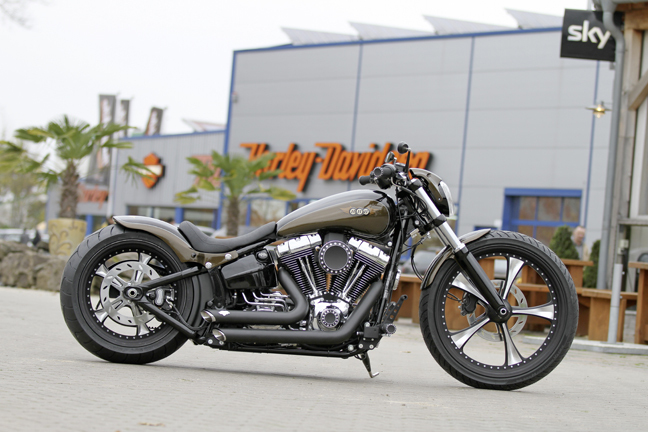 Thank you for your interest in Eurocomponents’ parts for Harley-Davidson Breakout’s. 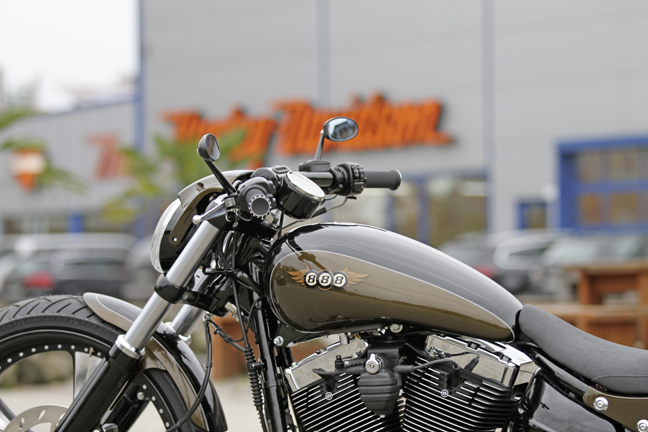 Yes, our Headlight and Fairing Kit for Breakout’s can fit your 2014 CVO Breakout, no problem. 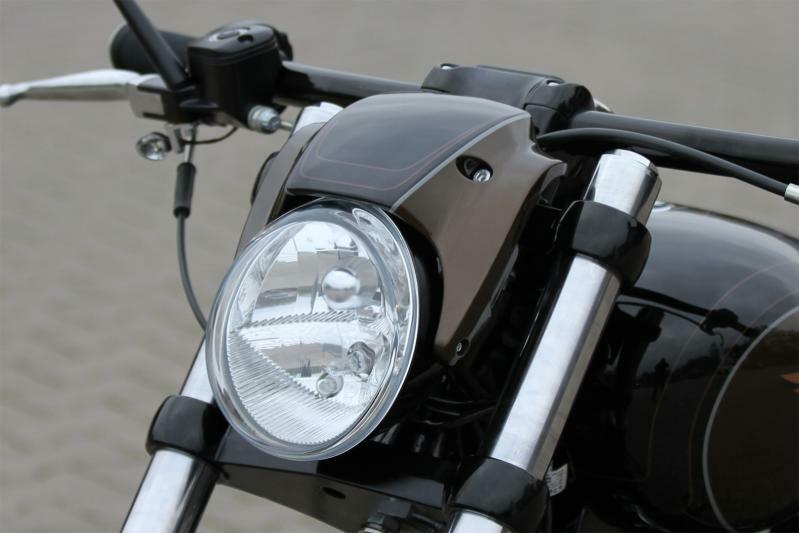 Hey, I’m interested in the headlight kit and was wondering if the bars had any impact on fitting as I’ve change mine? No, different bars do not impact fitting. As you can see we have used pretty low bars and they clear no problem. Sorry, but we do not provide exchange rates, please contact your bank. 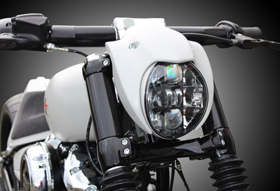 Thank you for your interest in our Headlight and Fairing kit for Harley Breakout’s. Sorry, but we do not sell parts separately. No problem to ship to Australia. Hi I have a vrod light and fairing which I was able to buy of a friend. Do I need another bracket to mount this light to my breakout? At the moment it fouls on the risers. I already have the flat riser kit. Yes, you need to fabricate a new mounting bracket. Would you be able to provide some details on what’s required in fabricating a new bracket to mount the light? I’ll have to make it my self as I can’t find any one I Australia with any details. Sorry, but I am not allowed to distribute any designs or instructions on how to duplicate our parts. Is it possible to purchase the breakout fairing kit without the headlight? 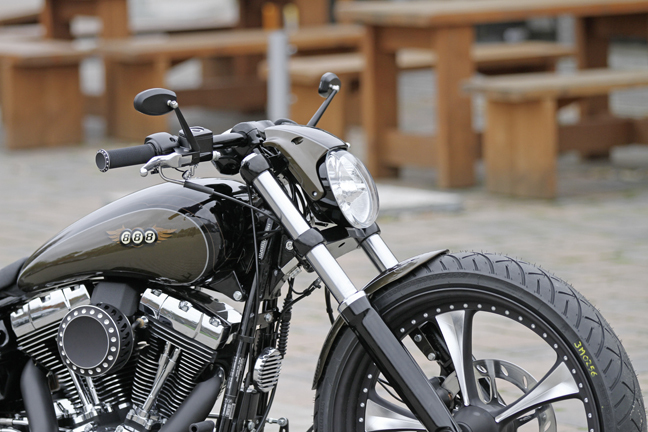 Thank you for your interest in Eurocomponents’ Headlight and Fairing Kit for Harley Breakout. 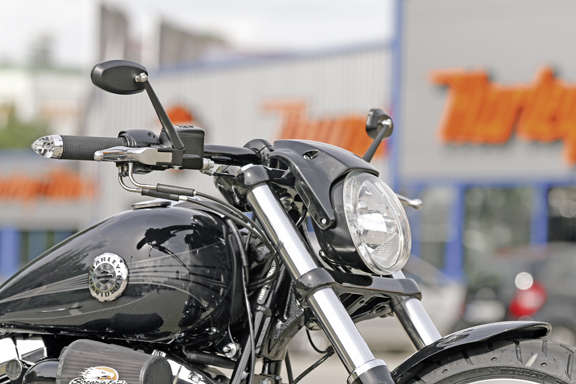 There is a video to see how install it and how install the new headlight? Vrod plug and breakout plug for headlight are different, so I would know if I need to cut original wire or something else. 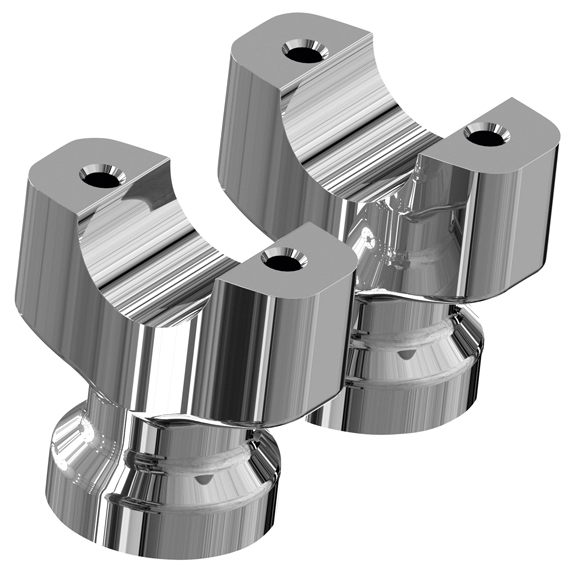 Thank you for your interest in Eurocomponents’ parts for Breakout’s. Yes, you will not be able to use the stock plug and you will need to solder wires. Sorry, but no instructions are available. 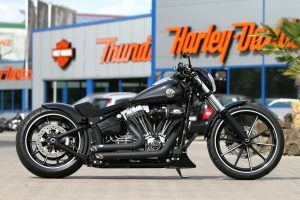 hello will this Flat-Riser Kit For Breakout Headlight Kit fit on the 2018 Harley Davidson breakout as it has different forks on it. If it does, do you ship to Canada? Yes, the Flat-Riser Kit For Breakout can fit also 2018 models. No problem to ship to Canada. UPS shipping to Victoria Australia is USD 341.50. Do you sell the front spoiler ? 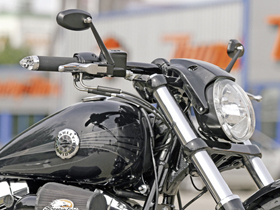 Does the Flat-Riser Kit For Breakout Headlight Kit work for 2016 cvo breakout? Does the kit fit OEM bars? 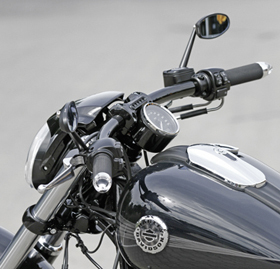 Yes, the Flat Riser Kit can fit your bike and OEM bars. Just specify year and model at time of order.